Finding the best mattress for a couple can be harder than for a single sleeper because you can’t just consider your own sleeping preferences. You also have to consider what the other person would like. Sometimes, you both like the same textures and materials, but oftentimes one prefers firmer or softer, or one may toss and turn and accidentally wake the other partner. The following five mattresses address these issues to make sleep better for both of you. There are few mattresses made specifically for couples, but these would all be larger beds. The best beds address issues that commonly afflict couples while they sleep. For example, beds with adjustable textures are ideal if one likes firm and the other soft. Or, materials that resist motion transfer are best for those who toss and turn, like memory foam, latex and independently wrapped coils. Starting off with an adjustable mattress, this is perfect for couples who cannot agree on softness or firmness. You get 45 unique settings, ranging from 5 to 50, that govern how firm the bed is. At 5 the bed will be as soft as a cloud, but at 50 it’ll be firm and unyielding. This gives you amazing control over how you sleep. Since the mattress is split in half, the settings on one side will never interact with the settings on another. Aside from that, the cooling memory foam reduces motion transfer and keeps you cool throughout the night. The outer cover is reversible depending on season and temperature preference. The summer side keeps you cool while the winter side traps heat. To prolong memory foam mattresses, you should regularly switch the layers. This bed makes that very easy, and you can buy new layers if one wears out to improve overall longevity. The best thing is that you can adjust this bed to match your exact preferences. Another great benefit is that you can adjust the heat by changing the outer cover. However, this mattress is very heavy, and you’ll need some time to set it up. If one partner can’t stop moving during the night, then this could be the best mattress for you. Not only that, but it’s medium firm feel should be good for those who like firm, but still soft enough for those unused to harder surfaces. The base layer is 7 inches and composed of individually wrapped coils in foam, which is great at isolating motion. Above that is a layer of memory foam and then another layer of latex, which are also motion isolating. This combination of latex and memory foam gives the bed a comfortably firm feel without being too hard. Another great benefit is that the mattress is cooling, ensuring that neither partner gets woken up from too much heat. From the great motion isolation to the medium feel, this bed hits many of the marks that couples need to sleep comfortably. On the other hand, those who want a “true” latex bed might dislike the 7-inch base layer of coils and the memory foam layer. While the benefits of latex shine through all that, those who dislike coils and foam may have a problem with this bed. While not quite as adjustable as the Personal Comfort bed, this one can still be adjusted to meet your demands. The three settings are soft, medium and firm, and it’s easy to select the right one for your needs. The soft isn’t too soft, ensuring that both partners are happy, and the firm is still comfortable enough for a good night’s sleep. Along with the adjustability, this 12-inch bed is composed of three different layers of foam. There’s the 8-inch high-density base, a 2-inch layer of firm foam for support and then the top layer. The top layer is what determines the texture, and it’s also infused with gel to make it cooling (the soft one isn’t as cooling since you sink in, but it’s still cooler than other soft mattresses). You can adjust the bed’s texture to match your preferences, and the gel ensures that both partners stay cool and comfortable. At the same time, you can only adjust the top layer, so both partners have to come to an agreement. Also, the soft isn’t as soft as some other beds, which may disappoint those who love plush mattresses. To some, green tea mattresses are a fad. Whether or not you agree in the health benefits of green tea, there are some definite benefits that couples will love. First of all, since green tea oil replaces some of the other chemicals used to make the foam, these beds tend to resist odors better than others. They also have a pleasantly firm feeling that most sleepers love. 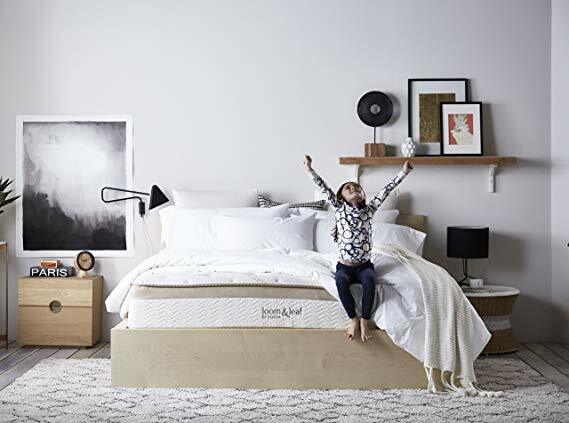 This bed uses only CertiPUR foam, which further reduces the chemical load, and the various layers are crafted to reduce heat and improve comfort. The top 2-inch layer has gel to improve comfort and reduce motion transfer. The mattress is shipped rolled up and only needs 48 hours to regain its previous shape. Regardless of your thoughts on green tea, there are actual benefits with reducing odors and bacterial growth. As a medium firm mattress, most couples will be able to agree on this bed, and the layers should keep most sleepers cool. On the other hand, this bed could be better with motion transfer, and the foam will get softer with age. Some people just like spring beds, and there’s nothing wrong with that. From their affordability to that traditional feel, they can provide a good night’s sleep. This Swiss Ortho bed is one of the best for couples because it gives you many of the benefits that you need to comfortably sleep together. First of all, every coil is independently wrapped. This ensures that motion transfers as little as possible, so one partner shouldn’t wake if the other moves. You’ll also find that the bed properly supports all the pressure points of your body so that nothing feels pinched or pressured as you sleep. Another benefit is that the material slowly contours to your body. This reduces tossing and turning, and many people find the contour to be comfortable and cozy. This is one of the more affordable beds on this list, and it’s actually very good at controlling motion transfer. Some people may dislike the contour as you might feel stuck, and there has been a prejudice against spring beds, but it’s actually very comfortable.